— The man who wrote the US Constitution? It is certainly an overstatement that the Constitution of the United States of America was written in a beautiful old building still called "the castle" in Vico Equense, a small town on the Bay of Naples about halfway out the Sorrentine peninsula, but that's what citizens of that hamlet delight in telling visitors. Viewed charitably, it's a good story, a very human one with just that kernel of historical fact that piques one's interest. It also provides a small introduction to the person of Gaetano Filangieri, a leading figure of the Neapolitan Enlightenment, a philosophical movement that thrived in the mid-and late 18th century. Filangieri may not have been the John the Baptist of class warfare that later Marxists like to claim, but he was a formidable advocate of reform, calling for a large class of small property owners, universal public education and equality before the law. He wanted unlimited free trade and the abolition of medieval institutions, which impeded production and national well-being. He called for freedom of the press and tolerance in juridical and social matters, ideas that would later mark the age of post-absolutist Europe. These ideas certainly had their philosophical origin in the French Enlightenment but they remained in that lofty arena of philosophical debate until Filangieri wrote down the specifics—how they laws themselves would actually look on paper. The Science of Legislation was a masterpiece of the Italian Enlightenment and in 1784 was also put on the Index, the Roman Catholic Church's list of banned books. Filangieri's view of events in the New World, specifically, the American Revolution, underwent some interesting changes. Like many Europeans, he saw America from a colonizer's point of view. In The Science of Legislation he frequently refers to the entire western hemisphere—all of the Americas—as "Europe's farm". His main concern for social equality and justice in the Americas seems to have been a pragmatic one; this is, if Europe abused her colonies in the New World, they might rebel, fall away and become independent, depriving Europe of a great resource. Thus, good government was good for everyone, fair to the governed and profitable to those who govern. Even as a child, my eyes were drawn to Philadelphia. I have become so used to viewing it as the only place where I might be happy, that I can no longer get that idea out of my head ... But how can I leave my country? ... Might not my own works on the law lead you to consider inviting me to help draw up the new legal code you are preparing for the United Provinces of America? ... Once I got to America, who could ever convince me to return to Europe! How could I ever then leave that haven of virtue, that land of heroes and city of brothers, all to return to a nation corrupted by vice and degraded by servitude? ... Having known a society of citizens, could I ever again desire the company of courtesans and slaves? Filangieri died of tuberculosis in 1788 at the ridiculously young age of 35. That was, however, long enough to see the inadequate Articles of Confederation fail to regulate the new "haven of virtue and land of heroes". 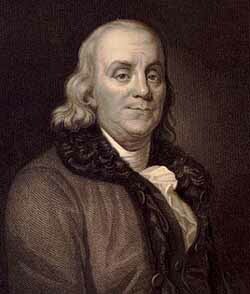 And it was long enough to see his pen-pal, Benjamin Franklin, in spite of great age and infirmity, head the Pennsylvania delegation to the hopeful Constitutional Convention of 1787. Franklin sent Filangieri a copy of a draft of the new Constitution, appending the note, "...it may be a matter of some curiosity to you, to know what is doing in this part of the world respecting legislation." It is not clear whether Filangieri received and read that before his death. After Filangieri died, his wife sent Franklin a poignant note, relating that her husband had left her nothing but the "memory of his virtues". Here, again, we don't know that Franklin got the note before he, himself, passed away. Well, he does deserve his reputation as an enlightened reformer. Did he really have anything to do with the substance of the US Constitution? I don't know. And that puts me in pretty good company. It is true that Franklin ordered a lot of copies of everything that Filangieri wrote, so he was obviously doing something with them besides reading them, himself. Perhaps he was handing them around to his friends as they beat themselves up over how to formulate a workable document that would govern a new nation. (There was no integral English translation of the Science of Legislation until 1806, but bits and pieces of it are bound to have been in circulation well before that.) So, if my friends in Vico Equense want to believe that Gaetano Filangieri burned the midnight oil in "the castle" turning out drafts of the US Constitution to pass on to Franklin who then informed the Convention —well, then, who am I to meddle with a good story?